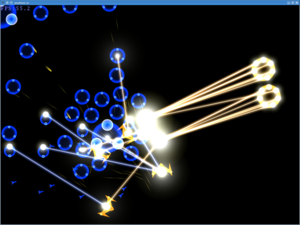 I started perfectstorm because i was annoyed with the Artificial Intelligence offered in most commercial RTS games. Although significant academic research is going on, it seldom finds its way into released games due to publishers’ wishes for absolute stability of the “gameplay experience” and the notion of AI as just being responsible for pathfinding plus something. Naturally, AI development can only begin late in the development cycle when the deadline is nearing. The most pressing feature the single “AI guy” most teams employ has to do is implementing pathfinding, which is not even part of AI if you want to see it that way. 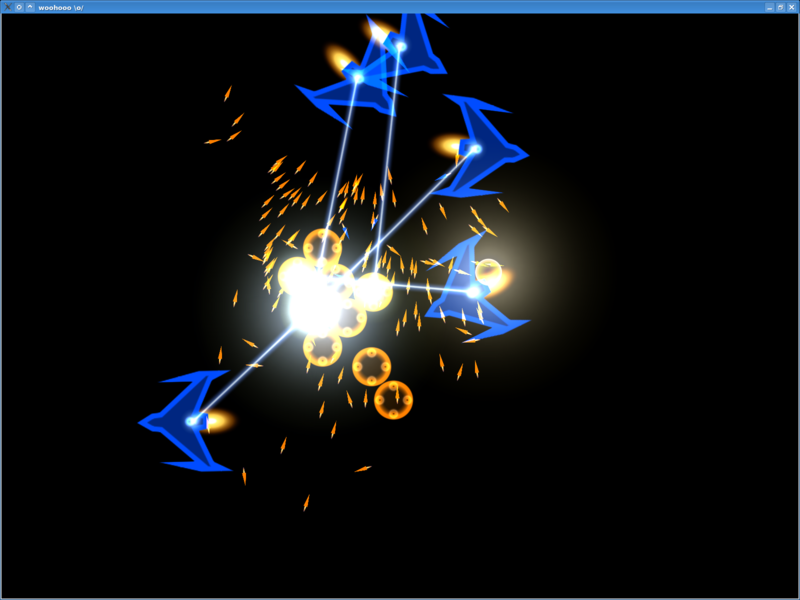 After that, only a poor makeshift enemy AI can be implemented before the product is shipped. Aside from that, writing good AI is hard. Or so i heard. 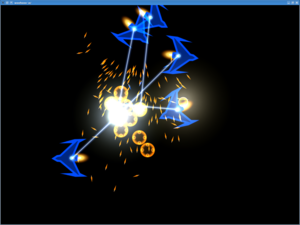 For graphics, i first tested SDL, the 2D part of which turned out not to be hardware-acceleratable under X11. OpenGL was the only alternative and — thanks to the excellent cl-opengl bindings — is very easy and fun to use. 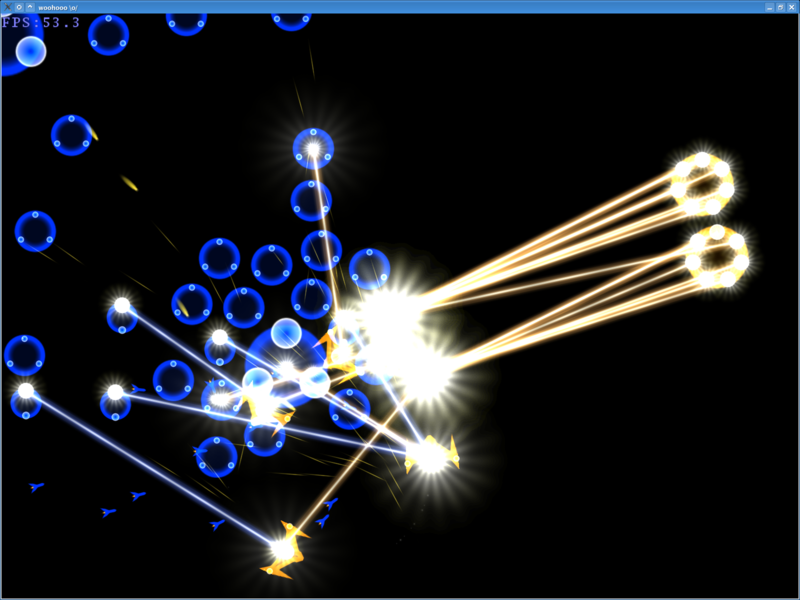 Now i needed textures and decided i wanted a defcon-like slick minimalist-but-pleasing look. No complex models or realism was needed, so i figured drawing nice antialiased primitives and gradients would be enough and settled for cairo. While cairo is certainly not fast enough for drawing life animations, it produces very nice output and is reasonably easy to use, although the cl-cairo bindings are a pain (i hear that with cl-cairo2 and cl-cairo-cffi two alternatives have emerged). After spending quite some time setting everything up and finally successfully extracting pixel data from cairo i started defining first units and implementing dummy game mechanics and graphics. You are welcome to try it and play around if you like, or even contribute something. Currently, the svn version is not guaranteed to be in any usable state or even to compile. Since we are more or less concentrating on one feature at the time, it is likely you will see some debug output concering the current development focus when just starting it. Dependencies are listed in the README file. You can check it out from svn://erleuchtet.org/perfectstorm. You will need both the cairo and OpenGL bindings from the same svn repo since i added some features that are needed by perfectstorm. But beware! 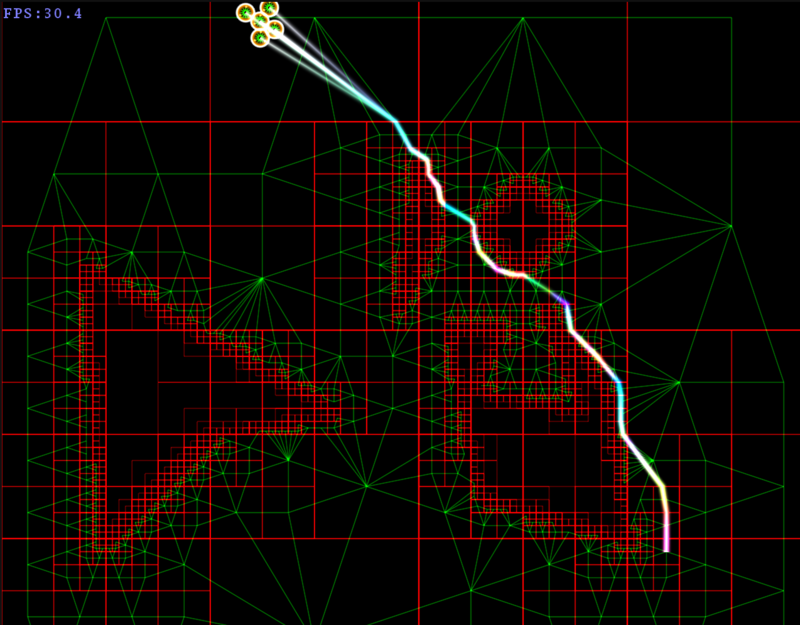 the current state is not that presentable: you’ll just see pathfinding debug output at the moment. When a first dummy is playable and the code is cleaned up a bit we’ll make a project page. What you are basing your impression of the current state of AI in the games industry on? 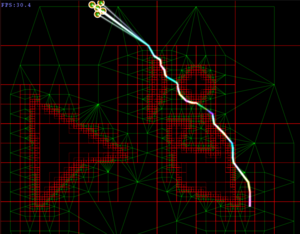 There seems to be a lot of very interesting talks on AI every year at the GDC, and they are rarely about pathfinding. Why do you think there is only one AI programmer per studio, and they can only begin late in development? I wrote cl-cairo2, and still maintain it as I use it on a daily basis. You might want to take a look, it is pretty stable and has a tutorial to get you started. There is no explicit code for xlib image surfaces/contexts, the current one is embedded in a small scale interface with a threaded event loop that allows you to draw into an X11 window, but it is just a few lines to write (contact me if you need it). It looks cool, but unfortunately I'm not able to get cl-opengl-thomas to compile on my Mac OS X w/ sbcl 1.0.15. You might have to use cffi-newtypes instead of cffi. 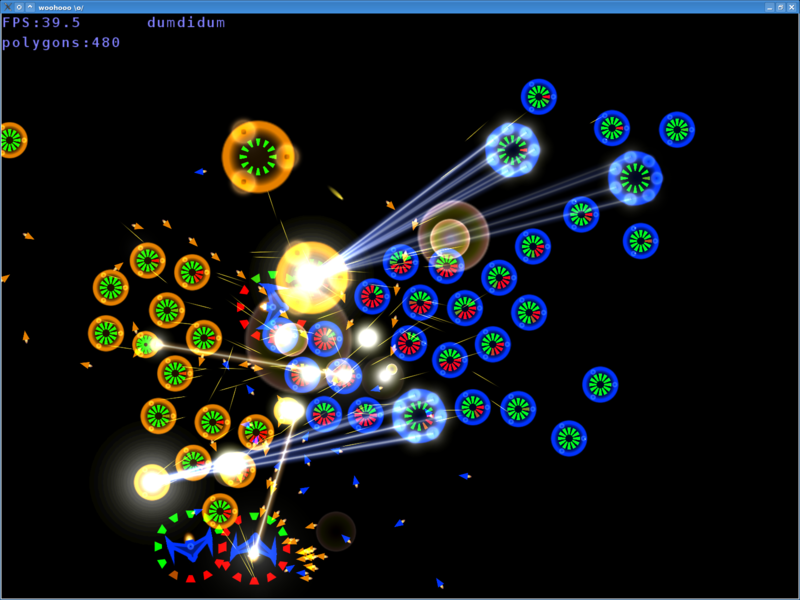 After this you might be running into more problems with OpenGL on OSX. In this case look at http://www.esden.net/blog/ for a solution. I'm basing my impression on several articles i read on gamedev and similar sites. While the number of only "one AI guy" might have been slightly exaggerated, the overall impression of AI being neglected seemed to be agreed on by several authors (I can't find the actual articles right now). I have no first-hand experience in the business, though. I can't seem to get the toolbox repo, it gives me a 404. Perhaps there is a typo in the README? After downloading and setting up all the packages (i.e. making *.asd files symlinks) I started sbcl and tried to load the game: (asdf:oos 'asdf:load-op :perfectstorm). freeglut  ERROR:  Function  called without first calling 'glutInit'. There is no class named ENSURE-INTEGER. Wow, that is great. Simplicity is really beautiful. I can't wait until this is usable enough to play. Sweet, I like the look. I'll pull from svn and see what I can get working as soon as I get home. I hope you don't mind my peeking though to see how you've got things working so far, I'm working on a simple turn based game right now that focuses heavily on AI. @Rudolf: it seems you need to create an extra init function to be called on the image's startup. What's happening is that the gl bindings do a proper gl(ut) initialisation on load, but apparently not when you invoke an image, as then SBCL skips some steps. I'm not sure if there's a generic solution to this, or if you just need to poke each library that has dependencies on outside state being initialised (like glut) separately. I tried Rudolf's naive approach, too, and of course got the same results. If you manage to package a cl-opengl application, i will be most interested. Okay, I got it to work under Mac OS X. It is pretty raw, but groovy anyway. I made a source directory ~/Source. After reading http://www.esden.net/blog/ , I downloaded the cl-opengl-thomas from http://www.esden.net/content/lisp/cl-mac-native-opengl-thomas-0.1.tar.bz2 . I hand applied this patch: http://www.mail-archive.com/cl-opengl-devel@common-lisp.net/msg00147.html to the cl-mac-native-opengl-thomas sources. I then changed directories to ~/.sbcl/systems and did "ln -s /Users/me/Source/cffi/*.asd ." Back to ~/.sbcl/systems, "ln -s /Users/me/Source/cl-cairo/*.asd ." (and of course I did this for infpre and toolbox too). Start up sbcl and do (require 'asdf), then (require 'asdf-install), then (asdf-install:install 'metabang-bind). Use MacPorts to do "sudo port install cairo" and "sudo port install freetype". Edit cairo_t.lisp, and make sure that the "cairo_get_miter_limit" function and "cairo_get_miter_limit" function both end with *limit*, not *limet*. (Limit ends with IT, not ET). I didn't know this was possible in CL! I may have to join you in a couple months (once I graduate). But i concur: i was at first skeptical myself about lisp's adequacy for games. Although there were some difficulties to overcome, lisp has proven itself and now provides a working and productive environment. that looks really nice. The graphical style reminds me of Geometry Wars, one of my favourites. I recently learned some Common Lisp. I really like it. Especially the REPL and the way it integrates into Emacs with SLIME make it easy to get started with. Hopefully it gets more attention in the future. Could you tell me where can I get "cffi-newtypes"? 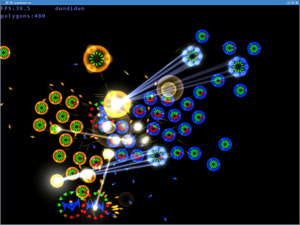 The link http://common-lisp.net/~loliveira/darcs/cffi-newtypes is broken ( I've tried with darcs ). And from SBCL I recieve "Server responded 404 for GET http://www.cliki.net/CFFI-NEWTYPES?download" bug message. Googling gives not so much results :(. Any suggestion would be great appreciated. current cffi from darcs will do. sorry about the confusion. I am trying to install this on Kubuntu 8.04 KDE4 beta. I had to bootstrap the SBCL 1.0.16 from source. I also had to correct a missing stubs-32.h from libc6-dev-i386 to get everything to compile. I am using cffi+lotsastuff from http://common-lisp.net/~loliveira/darcs/ which I compiled by running make test-sbcl (not sure if that is correct. It made the .fasl files but failed some test). This is while loading CL-GLUT... I know other people have reported this issue. Hopefully I provided enough info for someone to narrow down the problem. Google barely has mention of "ensure-integer" and installing krmcl alone did not help.. I've installed current cffi with darcs. The svn is currently not up. Will the source be reposted or is it closed? I'm learning lisp and have been looking for a good example of how stuff like this implemented. Regardless -- thanks so much for sharing what's been shared already -- It's so inspiring! Hi Dustin, hi all of you who wondered about perfectstorm's current state. The project is more or less frozen since i got addicted to graphics programming. Also, i don't consider it the best example to learn lisp (especially because it is in semi-working state). But if you still want to look at it, you can drop me a mail at my-nick @ this-domain and i will send it to you. Your project looks great, we would love for you to participate! @Yuri: that looks like a debian version of SBCL, with Common-lisp-controller built in. It's not clear that anyone involved will be able to help you with this because of the non-standard use of C-L-C. I'd recommend building your own copy of SBCL from source (it's not too hard), or grabbing a binary tarball.